FabFilter's Twin 2 is a virtual analogue synthesizer focused on what-you-use-is-what-you-see. At all times, the interface only contains modulation sources and slots that you are using. This results in an easy to use user interface perfect for users of any level of skill and familiarity with virtual synthesizers. The Twin2 is packed full of amazing features and presets sure to inspire the user to expand their creative capabilities. 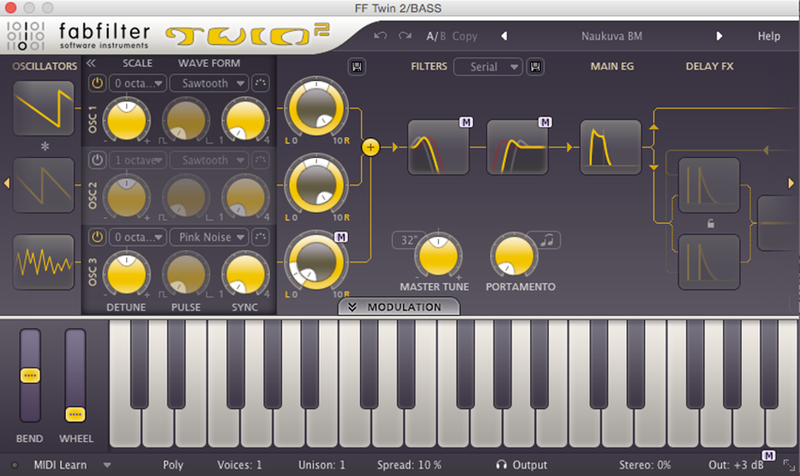 Twin 2 is a virtual analogue synthesizer with three oscillators offering triangle, sawtooth, square and sine waves, plus white and pink noise, two filters switchable between series, parallel and one-per-oscillator configuration and a delay section that can also double as a chorus/flanger. There is a pulse-width control and a sync control that allows oscillator sync effects without the need for another oscillator and, finally, you can set up ring modulation between oscillators one and two. It is easy to control FabFilter Twin 2's parameters with the large round knobs. The moment you move the mouse cursor over a knob, a parameter value display will pop up, which shows the name and the current value of the parameter. Each knob supports 4 ways of control: vertical mode, rotate mode, mouse wheel mode and text entry mode. All components that make up the synthesizer in the Twin 2 are displayed as large component buttons in the top section of the interface. You can edit the most important parameters of a component directly by clicking and dragging on the component button. As soon as you move the mouse cursor over a component button, value displays will pop up to reveal the current values of those parameters. 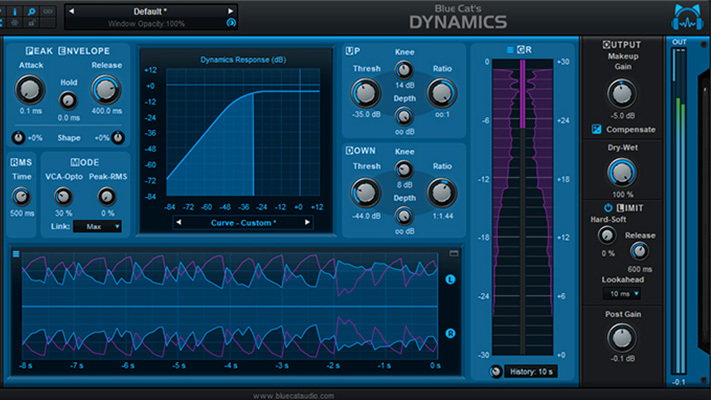 FabFilter Twin 2 comes with three full featured oscillators. Twin 2 has an exceptional broad palette of sounds. The oscillators are very analog sounding and completely aliasing-free. For every oscillator the following parameter are available: enabled, scale, waveform, phase sync, detune, pulse width, sync, level/pan, ring modulation, master tune/scale and portamento. Each oscillator is visually represented as a component button. By clicking on the component button and dragging, you can directly alter the most important oscillator parameters: detune, scale, sync, wave form. 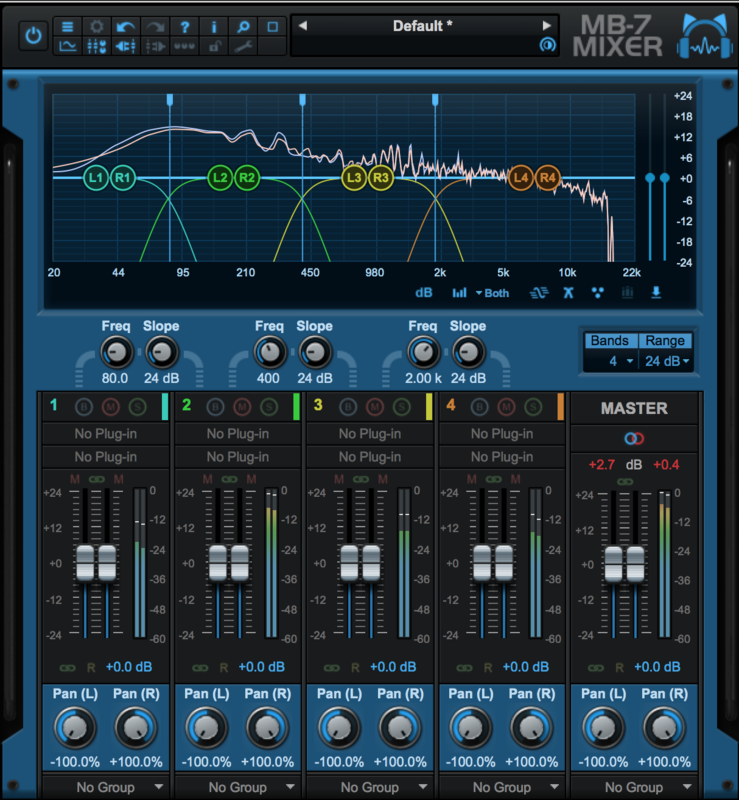 FabFilter Twin 2 has four multi-mode stereo filters. The two main filters are put right after the oscillators and the other two are used within the delay sections. The filters can be routed in three modes: serial, parallel and per oscillator/delay. Every filter can be switched between low-pass, high-pass and band-pass. For every filter the following parameters are available: frequency, pan, peak, characteristics, response, slope and routing. The interactive filter display gives an overview of the filter parameters and makes it very easy to adjust multiple filter parameters simultaneously. The vertical lines in the background represent a logarithmic scale that correspond to the actual filter frequencies. 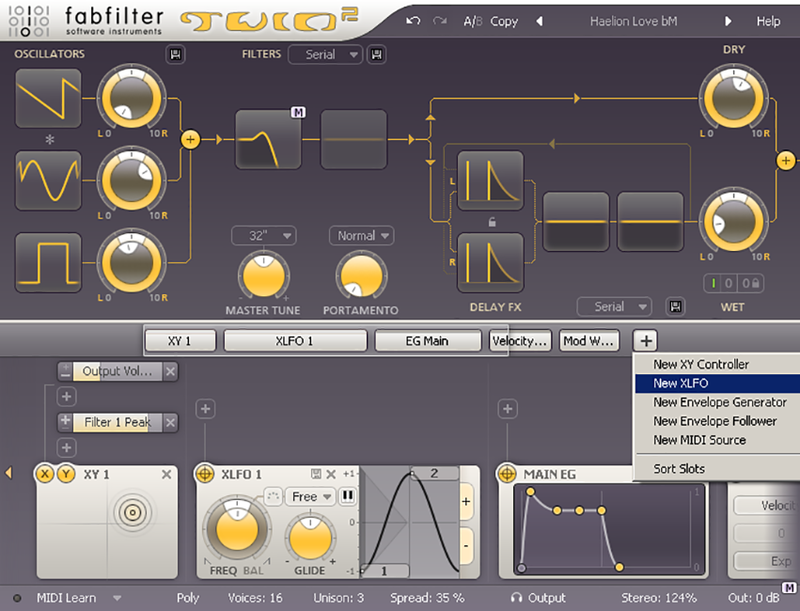 FabFilter Twin 2 comes with a very useful delay section with two filters. The delay section makes all kinds of flanging and chorus effects possible, as well as typical delay effects, to give your sounds more stereo depth and rhythmical subtleties. Delay can be a very important aspect of sound design and the ability to modulate all the parameters will generate innovative and new sounds. Ever-changing parameters can make your music become more alive because an exact reoccurrence is very unlikely to happen. 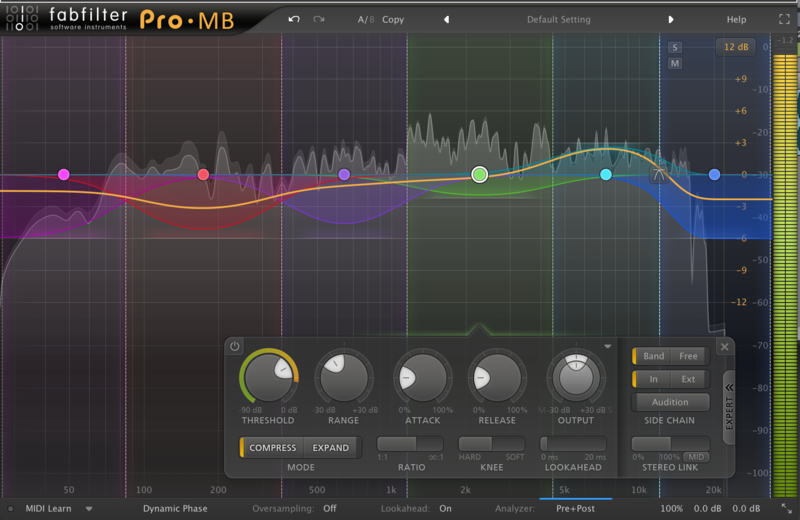 The XLFO is similar to a classic LFO but it can do much more. 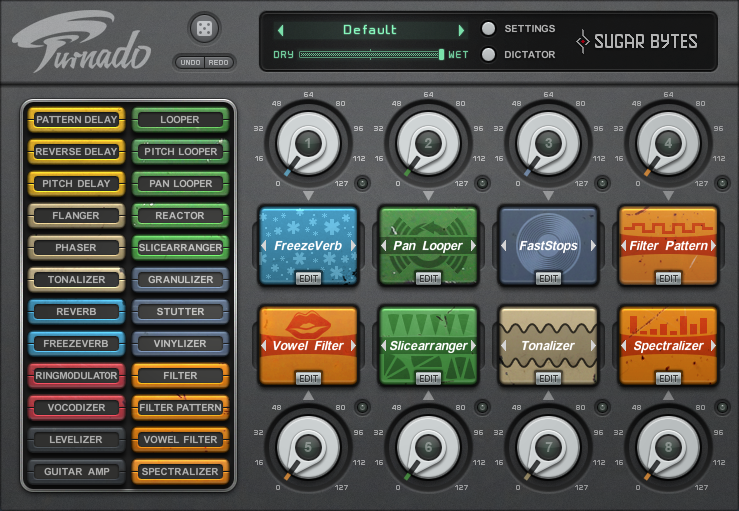 It can also be used as a 16-step sequencer with an individual glide parameter for every step. The display shows the waveform that is used by the XLFO. Steps can be freely added or deleted to shape the funkiest of waveforms. The XLFO can also be used as an arpeggiator. The values can be equally distributed over 2 octaves, so when connecting it to any pitch parameter, it will function like an arpeggiator. Twin 2 also contains a XY controller that can manipulate two parameters with one mouse movement. Controlling FabFilter Twin 2's parameters directly with MIDI is very easy using the MIDI learn feature. With MIDI learn, you can associate any MIDI controller with any parameter. Click the MIDI learn button in the bottom bar to enter MIDI lean mode. The interface dims and the parameters that can be controlled are highlighted. Three high-quality oscillators with PMW, hard sync, and phase sync. Four state-of-the-art multimode filters with filter panning and 11 characteristics. 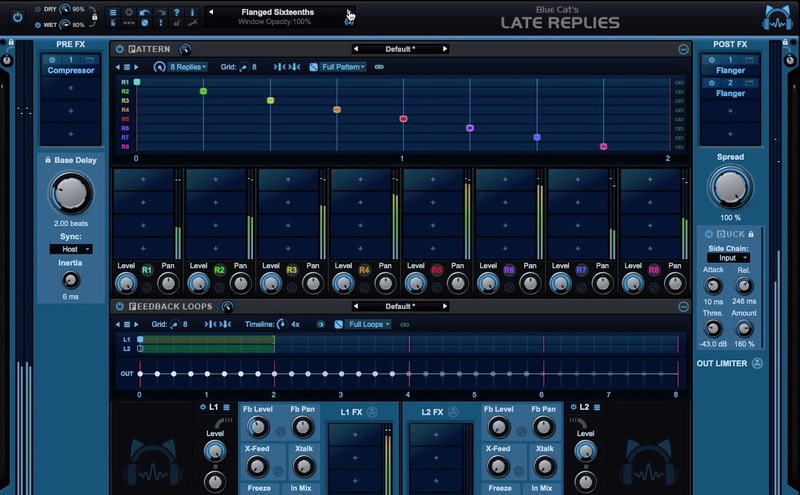 Extensive delay section with feedback and filter section. The resize button in the lower-right corner of the interface allows you to make the interface wider, so you can see more components and modulation sources at the same time. To fine-tune a value when using vertical drag mode or the mouse wheel, hold down the 'shift' key while dragging or moving the mouse wheel. To reset a knob to its default position, hold down the 'ctrl key' (Windows) or 'command key' (Mac OS X) and click the knob once. Disabling an oscillator reduces CPU usage. Also, the oscillators operate more efficiently when the 'sync' knob is set to 1 and is not modulated (disabling hard sync). When you want to change any oscillator parameter for all oscillators at the same time, just hold down the 'alt' key while turning a knob. The section presets button next to the routing button lets you store and retrieve all filter parameters as a section preset, which is very useful for accessing often-used combinations of parameters. By setting a delay time of between 30 and 100ms and adding a little gentle modulation with no feedback, you get the classic chorus effect. Delay times more than 100ms, will give you the familiar tape echo type of sound, and this creates more rhythmical effects. To reset the XY controller to its default position, hold down the 'ctrl' key (Windows) or 'command' key (Mac OS X) and click once. The mono mode of FabFilter Twin 2 uses last-note priority, so the last key pressed determines the frequency that you hear. When you release a key, the frequency slides back to the second-last key pressed, and so on. To browse presets without delay use the "0 lock" setting for the 'delay' enabled switch below the 'wet level/pan knob' to make sure a delay setting is loaded but not used. 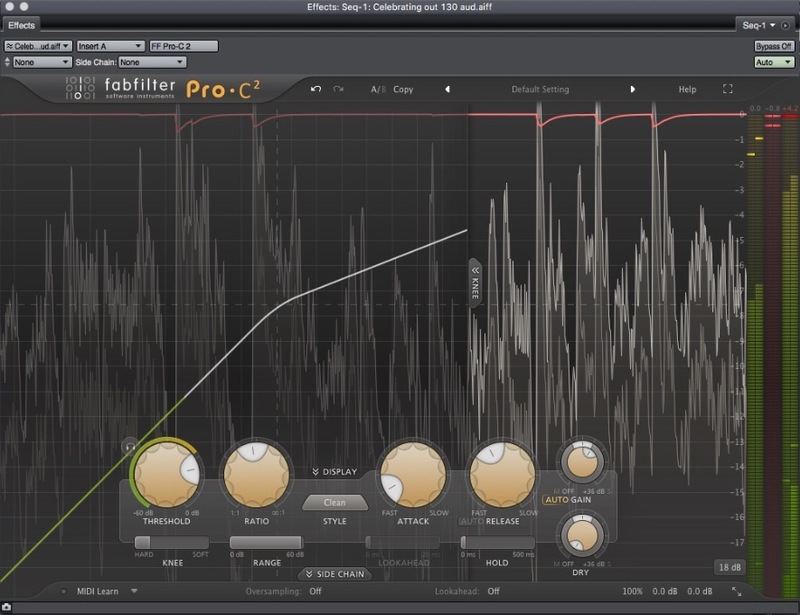 FabFilter's Twin 2 has been designed to make sound designing fast, easy and fun. The interface is great! A nice color scheme accompanied by intuitive navigation made it easy for me to just jump in and start designing presets right away. I personally think the what-you-use-is-what-you-see functionality of the interface is incredible. 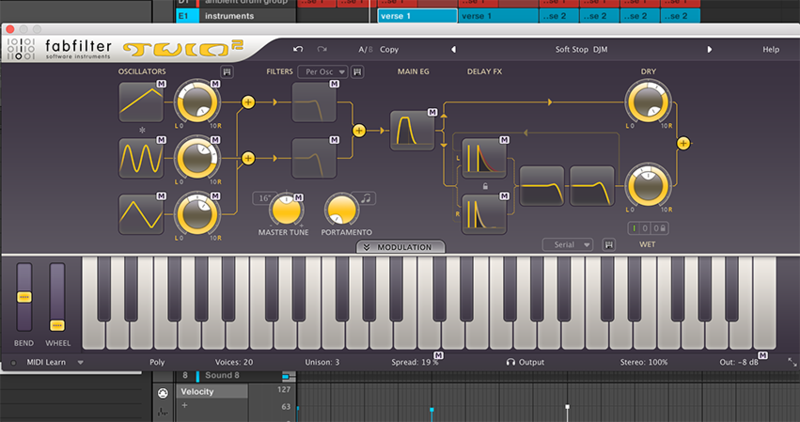 More synthesizers should adapt this model as it has me returning to the Twin 2 in almost every project I’m working on. When I open a new synthesizer for the first time, I navigate directly towards the presets. I do this because it allows me to understand the signal flow of the plug-in in addition to revealing how each parameter and modulation source affects the sound. Twin 2 was very different. 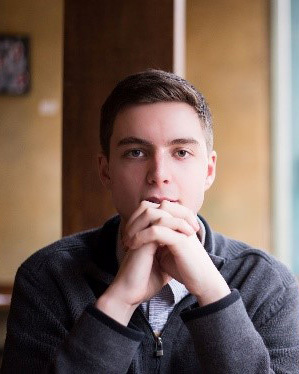 Upon first opening the plug-in, I chose the ‘clean’ preset and begun building my own sound. The quality of sound Twin 2 produces is on par with every other synths twice the price. 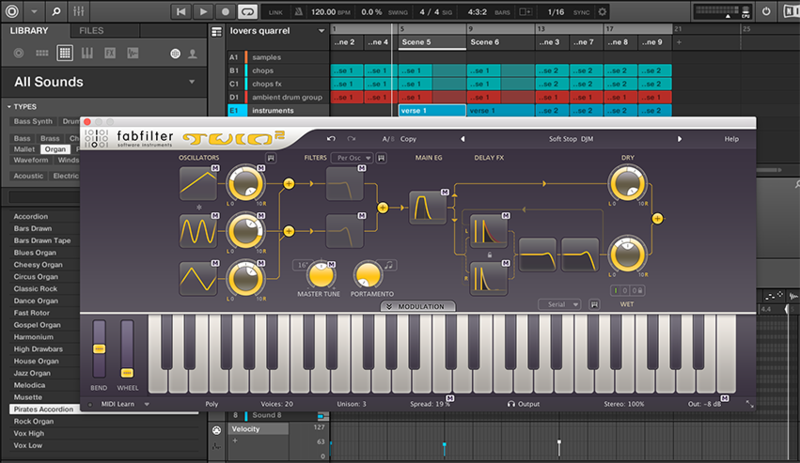 I found after about 20mins with the plug-in, I was beginning to get a good grasp on designing sound within Twin 2. 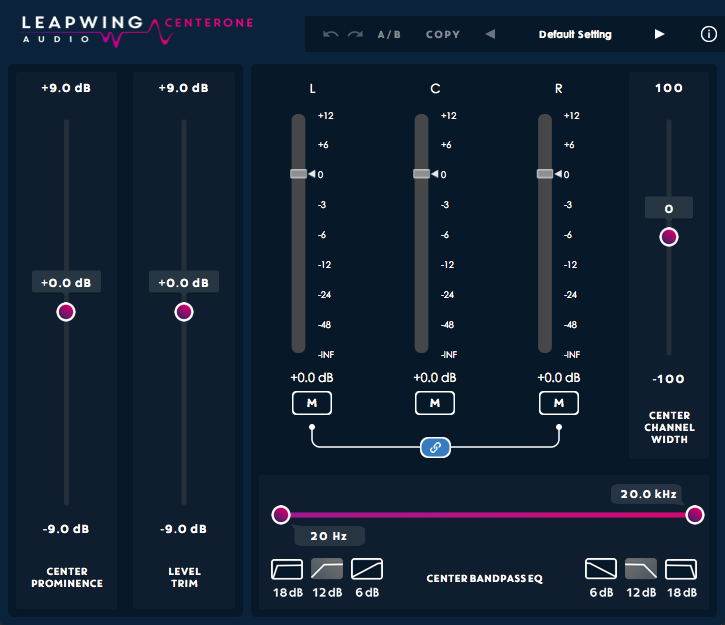 Twin 2’s preset library is very well organized and each sound is well-thought out and quite inspiring. I was very impressed by the overall hi-fi sound of the plug in. The bass sounds blew me away. Each bass preset and bass tone I was able to create had a degree of warmth I haven’t been able to achieve using other plug-ins. Twin 2’s possibilities are endless. It is a great plug-in. I am excited to start designing more intricate sounds and exploring the power of FabFilter’s Twin 2. Overall, I was quite impressed by this plug-in and its potential. Highly recommend.